Place the patient in lateral decubitus position, lying on either the affected or the unaffected side, as indicated by the existing condition. A small amount of fluid in the pleural cavity is usually best shown with the patient lying on the affected side. With this positioning the mediastinal shadows and the fluid will not overlap. A small amount of free air in the plueral cavity is generaly best demonstrated with the patient lying on the unaffected side. Exercise care to ensure that the patient does not fall of the strecher. If the patient is in strecher, lock all wheels securely in position. Achieve the best visualization by allowing the patient to remain in this position for 5 minutes before the exposure. This allows fluid to settle down and air to goes up. If the patient is lying on the affected side, elevate the body 2 to 3 inches on a comfortable platform or a firm pad. Extend the arms well above the head, and adjust the thorax in a true lateral position. Place the anterior or posterior surface of the chest against a vertical grid device. Adjust the IR so that it extends approximately 1 ½ to 2 inches beyond the shoulders. Exposure is made after the second full inspiration to ensure maximum expansion of the lungs. 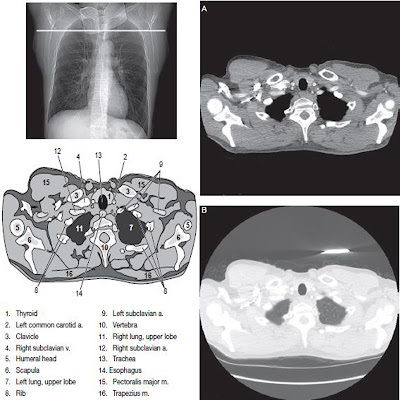 The central ray is horizontal and perpendicular to the center of the IR at a level of 3 inches below the jugular notch for the AP, and at the level of T7 for the PA.
An AP or PA projection obtained using the lateral decubitus position it will possibly demonstrate the change in fluid position and reveals any previously obscured pulmonary areas.